300,000 square miles is nearly twice the area of California. It’s difficult to visualize a space that vast, but go ahead and give it a try. Now, imagine this California plus-sized chunk of land is covered in thousands of feet of ice. Then, all of a sudden, that frozen fortress becomes a wading pool. 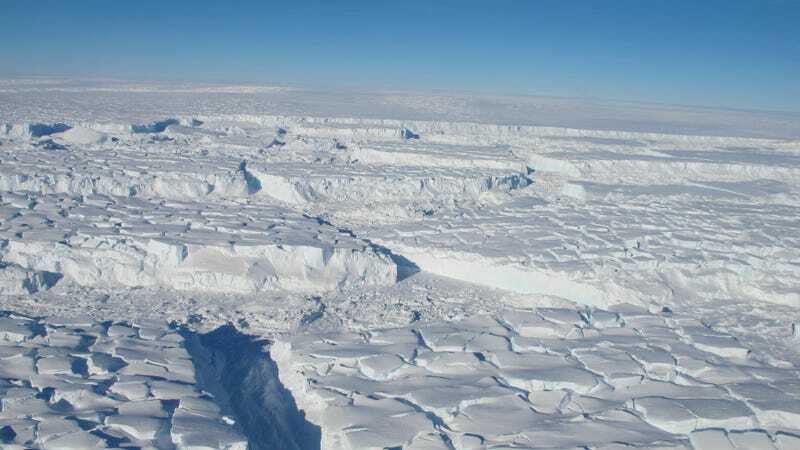 Alison Banwell, glaciologist at the University of Cambridge Scott Polar Research Institute who was involved in unrelated field work in the the far northwestern corner of the Ross Ice Shelf in January 2016, told Gizmodo she found the study “very interesting” but cautioned about jumping to conclusions. If nothing else, the findings point to yet another potential factor to keep an eye on as we watch Antarctica transform before our eyes. From hundreds of miles above the Earth to computer screens thousands of miles away, scientists are monitoring this frozen landscape, and what they’re seeing worries them.